In 2016, Peter Wennink, CEO of ASML – the company which helps create smaller, more powerful and energy efficient chips – posed the question: “Where are our new global hardware heroes?” HighTechXL and Get in the Ring joined forces to find the most promising innovators in high-tech manufacturing and connect them with ASML. We launched the AMSL Challenge. The result was a day-long battle where 13 shortlisted startups got the opportunity to discuss their business case in-depth with the ASML experts. At the end of the day, six finalists “got in the ring” to battle it out for a pilot contract with ASML. What does it take for a startup to scale? A lot of money, you may suggest. True, yet there’s more to that. The road to investment is lined with a few fundamental milestones, and – as investors will bet their money on only the most credible and relevant companies – a startup would need a strong business case. The answer is credibility and access to technological expertise, or in summary: a helping hand from an established company. Those were the words of Peter Wennink, CEO of ASML, when the company co-founded two fundamental startup initiatives in 2016 – MakeNextPlatform and HighTechXL – to set the scene to for the “new global hardware heroes” to emerge. 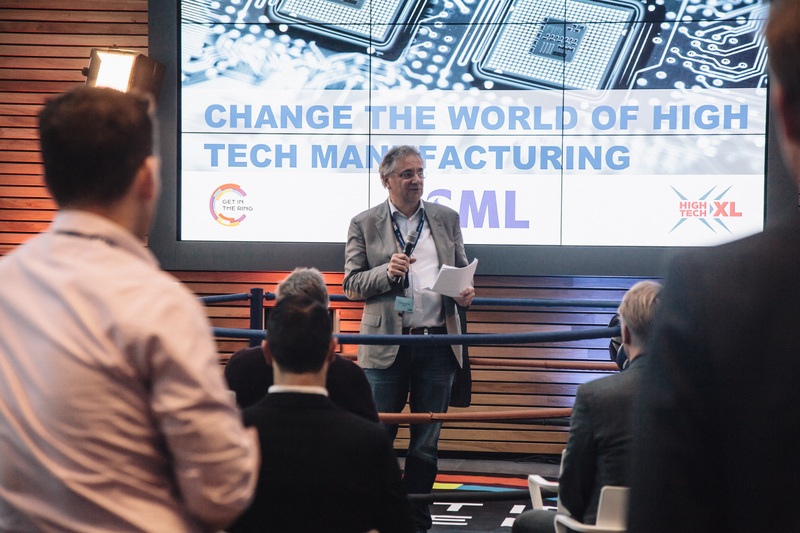 This year, as part of their pledge to give back to the community that once helped ASML grow, the company went out to find these promising young startups, and bring them to Eindhoven. “Our original intention was to attract high-tech companies to the region of Brainport and help them accelerate. But, how many are they, and where can we find them? Can we attract them?” shared Rob van der Werf, Director of Business Development. 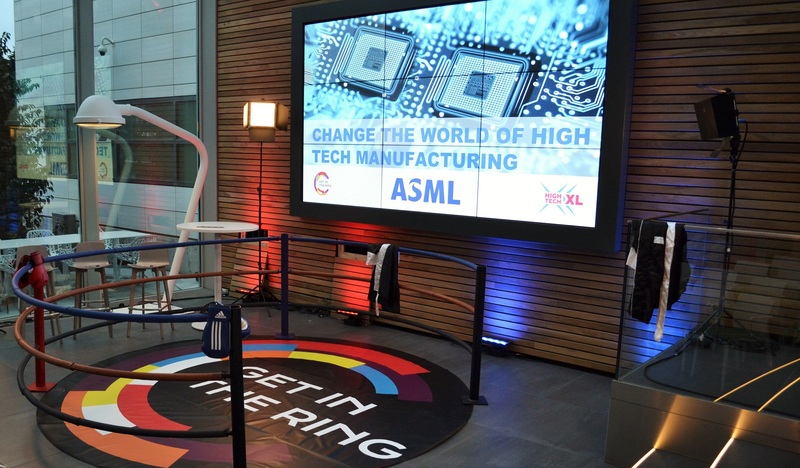 HighTechXL and Get in the Ring joined forces to find the most impactful innovators in high-tech manufacturing and connect them with ASML. Just as with Philips, we launched an open call for startups – the ASML Challenge. “We received 88 applications, all of them relevant, and this was amazing.” – Rob adds. Out of the 88 companies who applied, ASML invited 13 to sit across from the table, face to face, with 25 of their experts to help boost the startup’s proposition. Startup might not be the most accurate word to describe the companies we met. Because, when we talk startups, the kind of startups that come to mind are early-stage software, e-commerce, deep-tech, med-tech, and sometimes hardware companies. What we saw on January 31st were extremely fascinating, intricate propositions stretching from lithography, to nano-manufacturing, to fiber optics. We heard about award-winning technology and we met founders who’ve advanced their companies really far – as far as generating thousands and sometimes millions of dollars in revenues, having successfully closed rounds of venture capital, and formed a strong management team comprised of scientists and PhD holders. One of these founders was Guillaume Labroille, CTO of CAILabs – a French startup, specialized in optical beam shaping. The company develops and manufactures a range of light shaping components based on a patented Multi-Plane Light Conversion Technology. These innovative photonics components enable innovative solutions in Telecom, Datacom and Laser Manufacturing. Very excited, Guillaume explained that he travelled from Rennes to Eindhoven for the ASML Challenge hoping to seize an opportunity for a joint R&D project. As the technical guy in the team, he admits that there was another, unofficial reason for participating in the Challenge, namely that, in his own words, ASML is an “amazing” company he could learn a lot from. Guillaume wasn’t sure what to expect from the day. But after having spent the afternoon with ASML’s business executives, one-on-one, he is now determined to tap into the industrialization knowledge of company. The advice he appreciated most was “to focus”. “Human contact with decision- makers” was the highlight of Marty Dugan, Vice President Business Development and Marketing at Inprentus. Inprentus designs, manufactures and sells ultra-high precision diffraction gratings manufactured using an innovative, dual-atomic microscope scribing technology. The technology is particularly suited to x-ray and EUV diffractive optics in which features must be shaped with 0.1 degree angular precision. Marty “took a chance” and boarded the plane from Illinois to the home of ASML to build a relationship with ASML’s executives. Eventually, Marty and Guillaume faced each other in the ring where they competed for the pilot contract with ASML. Instead of punches, the two finalists exchanged achievements, answering the questions of the jury. In front of the ring sat Jan Smits (Executive VP Strategic Sourcing and Procurement), Paul van Attekum (Senior VP Strategic Business Development) and Frank Schuurmans (VP Research). The audience was also given a chance to vote for its favourite. After an almost even number of blue and red sticks had been flashed in the air by the audience, the jury had spoken. Get in the Ring’s master of ceremony was ready to raise the arm of the champion. Guillaume Labroille from CAIlabs prevailed over his challenger. In parallel, two other companies were offer a spot in the HighTechXL Accelerator Program (incl. 200 hours of coaching from ASML’s experts): FMC who commercialize a disruptive material innovation i.e. eNVM based on ferroelectric hafnium oxide, and RoboSculpt who create Precision Medical Robots which in the future will assist surgeons to do what is currently impossible.